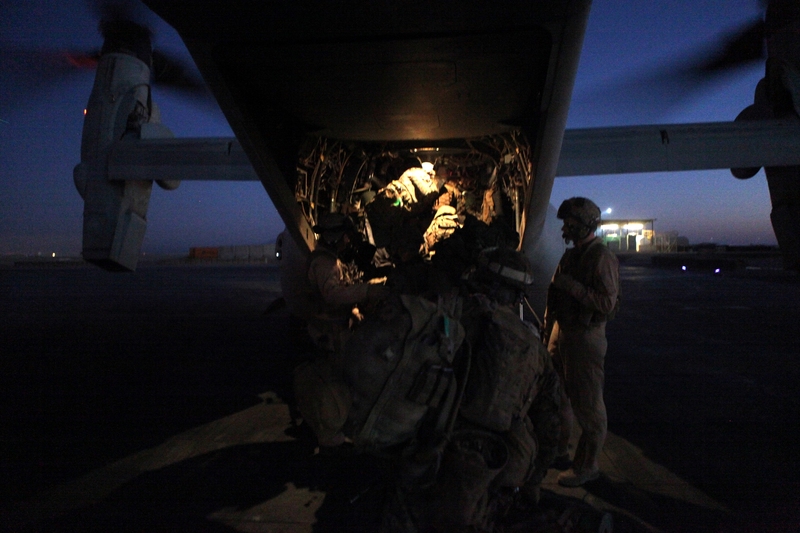 Members of 1st Battalion, 8th Marines, pile into an MV-22B Osprey Jan. 17, at Camp Bastion, Afghanistan. The flight was VMM-162's last on a six-month deployment. Marine Medium Tiltrotor Squadron 365 — The Blue Knights — deployed to Afghanistan earlier this month to replace VMM-162 which conducted its last mission there Jan. 17. The Blue Knights out of Marine Corps Air Station New River, N.C., departed Jan. 6 and will take over resupply and transportation missions in Helmand province for 162 which spent six months at Camp Bastion. The Marines of 365 spent their final days at home preparing their Ospreys for an aircraft swap with the pilots of 162. Due to cost, units don’t take their own aircraft when they deploy. Instead they use Ospreys already in Afghanistan and give their own to the retuning squadron.